The name of this gate derives from its symbolic significance as a prayer for peace throughout the world. Built with a two-storey irimoya zukuri (hip-gable) roof construction, it features a dedicatory plaque whose characters were penned by Kitashirakawa Fusako, former High Priestess of the Grand Shrines of Ise. 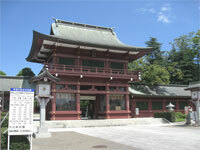 The Romon stands nearest the Hall of Worship after passing through the first torii, with the result that it is sometimes also referred to as the shinmon ("divine gate"). It corresponds to the Great South Gate found in many Buddhist temples. Since the Romon of a Shinto shrine often provides a place for the enshrining of two guardian deities known as zuishin (the Minister of the Right and the Minister of the Left), the gate is also known as the Zuishin Gate. The Kasama Inari Jinja displays two zuishin carved by Washio Sekiran, a famous wood sculptor of the Aki Domain (in present-day Hiroshima Prefecture) and dating from the Bunkyu period (1861-1864). The plaque visible above the Romon is written with characters meaning "Gate of World Peace." The characters were originally written by Kitashirakawa Fusako, who was high priestess of the Grand Shrines of Ise at the time of the gate's completion.